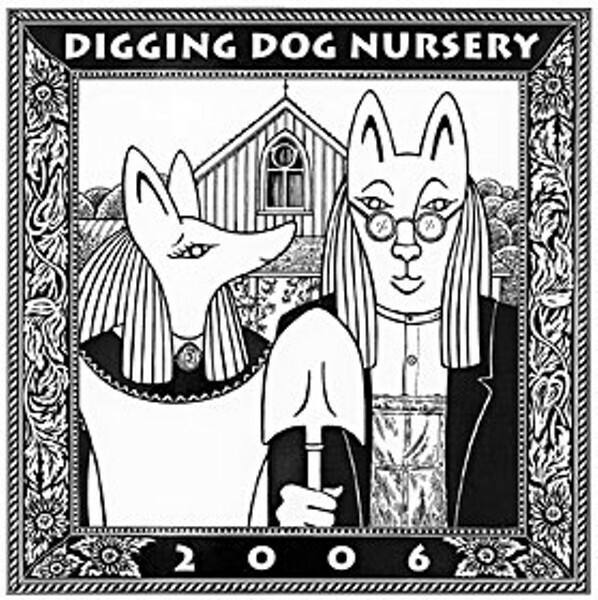 2006 catalog cover for Digging Dog Nursery courtesy of Marsha Mello. 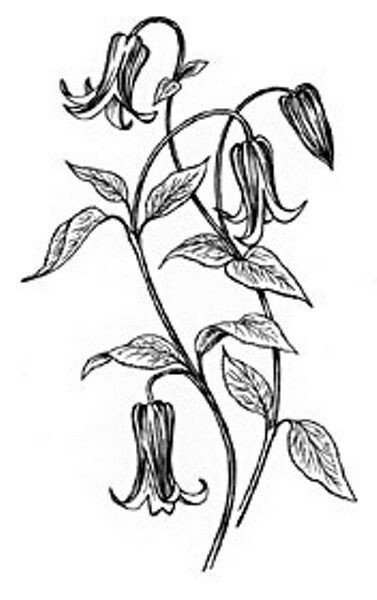 Clematis "Rooguchi" illustration by Marsha Mello. A couple of weeks ago, I took the long way home from the Bay Area and drove through Mendocino. Before I left, I made an appointment to visit Digging Dog Nursery, source of all good things in the universe. Well, my universe, anyway. Our anticipation soars as we wait for round buds to finally unfurl a galaxy of small starry blooms twinkling in rose-tinged lilac shades. Beneath the profuse late season display, tiny green leaves stay fresh for months, garnishing stiff branching stems, which angle out and form a well-mannered mound. Illuminated by citron-yellow centers with red streaks, the dainty daisies easily gratify companions like Achillea "Hella Glashoff" or Origanum "Bristol Cross'. Or what about this description of Euphorbia "Jade Dragon"? Evoking images of viridescent dragon scales, the pointed, blue-green leaves create a compact, deer-proof assemblage that's infused with reddish purple tinges. This robust, tidy-looking Milkwort shoulders summer blooming chartreuse flower heads nearly one foot across. Consorts such as Panicum "Heavy Metal" and Eupatorium "Gateway" enhance its colorful hues. Viridescent dragon scales? Really? I find these plants and their vivid biographies impossible to resist, and I place an order every year or two. But I really like to see plants in person before I buy them. 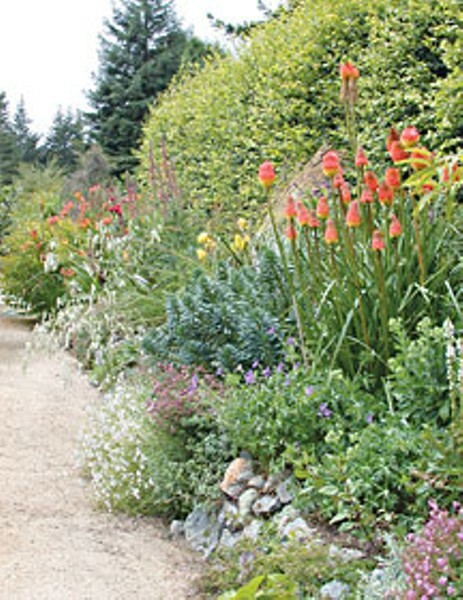 I also wanted to see their over-the-top perennial borders, which were featured on the cover of Martha Stewart Living 's gardening issue a couple years ago. So I cut off Highway 1 just before I got to Mendocino and followed a series of winding roads up to Albion, where Digging Dog is located. Here's the great thing about going to visit a mail-order nursery in person: The plants have not been overfed and forced to bloom before their time. There are no impulse shoppers to impress. Mail-order customers don't expect their plants to arrive in full bloom, and the few people who do show up by appointment already have a pretty good idea of what they're looking for and know that a plant that has been pushed to bloom early won't last as long anyway. The staff will hand you a catalog to help you identify any unfamiliar plants, and you're on your own. I was hoping to replace some plants that I'd lost during last winter's freeze, so I wandered through the hoop houses, looking for signs of my dearly departed. Once I'd rounded up everything I needed, I walked up and down the Martha Stewart-worthy perennial borders to see if there were any plants there I couldn't live without. I left with a couple dozen plants that I didn't have room for, but why go all the way to Albion for one or two plants? Digging Dog is worth the trip. Check them out at diggingdog.com, and get on the list for their catalog if you haven't already. There's another reason to read their catalog. The illustrations come from Arcata artist Marsha Mello. She designs their cover and provides all the illustrations of plants for the catalog. Using pen and ink drawings instead of photographs in a garden catalog is a risky decision, but it cuts down on printing costs and it appeals to a certain kind of plant geek who doesn't need a pretty picture to decide about plant. I asked Marsha how she comes up with the right drawing for the plant. "They sent samples of the plants," she said, "and they'll send me some photographs to work from, too. One advantage to drawings is that they can be cleaner. A photo of a plant can get muddied when it's printed. I can do a detail of a leaf or blossom that gives a lot more information." Digging Dog also sells her botanical etchings and a line of greeting cards. Because of her association with the nursery, she's been commissioned to do other botanical art, including the illustrations for a book called The Plants of Middle Earth about all the plants in Tolkien's world. But the best part about the Digging Dog gig? "I get a very generous bonus in plants every year," she said. "In fact, I need to go through the catalog and decide what I want." Marsha, who moved here from Sonoma County seven years ago, is a member of Arcata Artisans and has a show there in October. Her etchings and watercolors focus entirely on the natural world. "I think I like wildlife better than humans," she said.